Caption slip reads: "Photographer: Paegel. Date: 1958-09-26. Reporter: Donoghue. Assignment: Bullfighter. Special instructions: Monday. 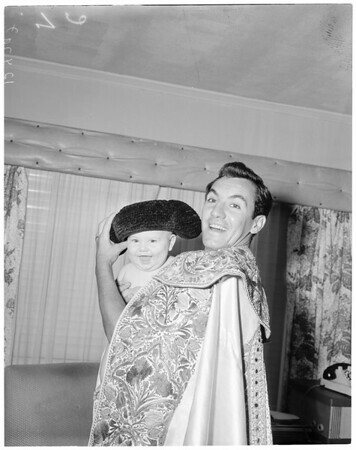 Matador Jaime Bravo, leading Mexican matador, and his five-month-old son, Jaime Anastasio. (Caption for all shots on Bravo)".